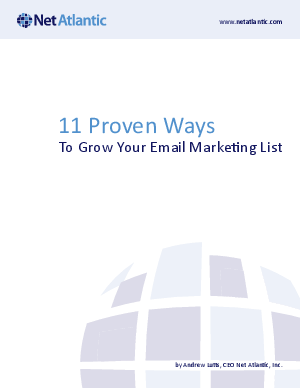 Net Atlantic's whitepaper, "11 Proven Ways to Grow Your Email Marketing List" helps email marketing and communications managers increase the number of list members who are actively engaged. A larger list of interested, opt-in leads is by far the best population for creating opportunities. Sending responsibly frequent email campaigns to your mailing list will improve your overall marketing ROI better than just about any other tactic. We'll show you how to increase opt-in leads faster than you lose them through unsubscribes and bounces, resulting in the overall growth of your list.